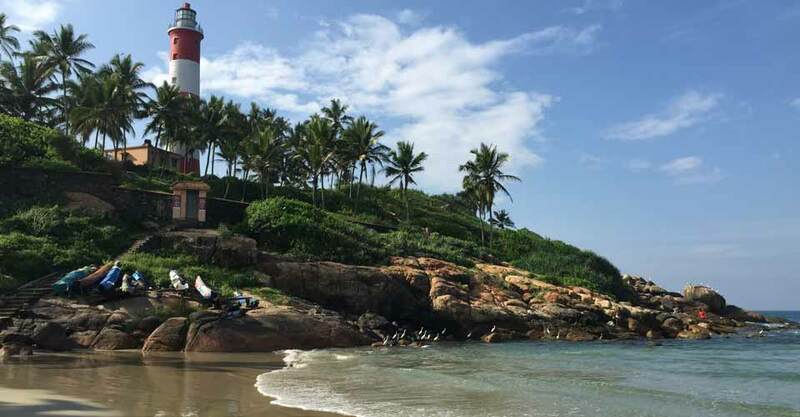 Kovalam, in the south of Kerala, is located beside the Arabian Sea and lovely sandy beaches. Originally a fishing village, it has developed over the last 30 years into a small seaside resort. Kovalam still retains its friendly village atmosphere and is popular with both foreign and Indian visitors. Two curved, sandy beaches – Lighthouse Beach and Eve’s Beach provide the picturesque setting for seaside holidays. Eve’s Beach is fringed with palms whilst Lighthouse Beach has a backdrop of restaurants and small shops, under the watchful beam of the lighthouse! 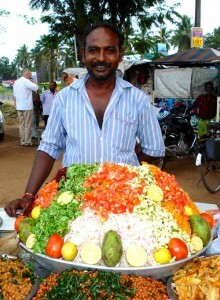 Kovalam restaurants cater for all tastes – with western-style dishes and local curries. The food is excellent – you can enjoy tea and banana cake at the local ‘chai shop’, or dine in restaurants on freshly-prepared sea food. Food is reasonably priced with plenty of choice for vegetarians. Sunset is a special time and it’s wonderful to sit in a restaurant or on the sand and watch the sun sink down into the sea. Fishing is still carried out from the beach, in the traditional way, and it’s fascinating to watch – or even help – the men haul in their nets. You can spend your days visiting local sights, lazing on a sun-bed and swimming in the sea, or at one of the local hotel’s swimming pools (for a small charge). There are also several other quieter beaches within walking distance. After the sun goes down is a great time to browse for jewellery, clothes, handicrafts and gifts. You can also enjoy having your own designs created – or your favourite clothes copied – by the skilled Kovalam tailors. There are good WiFi facilities for internet and international telephone connections in Kovalam. I feel like I have been on a real journey. I go home uplifted, rested, and ready for change.